ducati dose not start? just questions, no answer ! Multistrada.Net - Multi Owners Forum No 1. WARNING 1 : WHAT SO EVER YOU INSTALL OR DO TO YOUR DUCATI WILL VOID NON-EXISTENT REALLY LIMITED WARRANTY OF YOUR BIKE, MOST LIKELY YOU ARE VIOLATEING SOME EU-DIRECTIVES AS WELL. For other than VDST package you need Bluetooth ODBII reader based elm ship. Available at eBay store's ( Bluetooth ECU ) and those dose the same job as 5000eur orginal Ecu reader from Ducati ! Standard ODBII reader has ODBII connector that fit's you car's ODB connector. 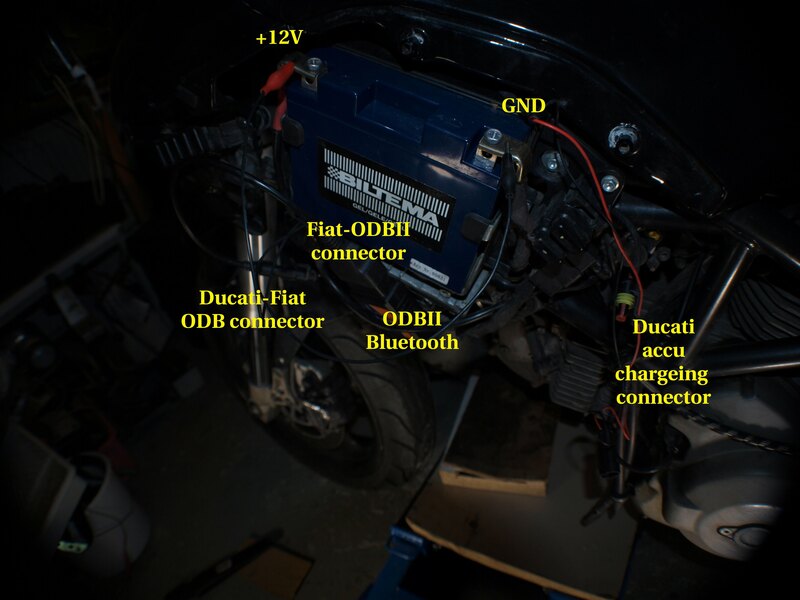 Your Ducati whit Marelli M5X ecu has not one but instead useing Fiat's ODB connector. You need Fiat connector/adapter cable ( Fiat Cable for Ducati ) . whit elm327 bluetooth v.1.4. than VDST and Ducati DIAG. It connects to ecu much faster and easyer than VDST or Ducati Diag ( it's night mear to connect ). It show basic data. Motor Temperature is 3 - 20 degree's higher than in console display. as well testing devices trough ecu. Connecting to ELM as well to ECU is easy. At small display not easy to use. No graphical metters like at VDST. It dose loging of mesaurment's. Yes, I have this appilaction on tablet for reapairs and at mobile phone for emergency! via service cable + professional ODB reader or LapTop/PDA and VDST. It has nothing magical inside but without it you can not adjust fuel trim, reset thortle position and if service light have been annoying - its dose not bother you anymore! I'am owner of Ducati MTS-620 and whit MTS-620 VDST gives wrong temperature value's. At bike's computer console readings are 136C and VDST tell's 96C but I have same kind of errors whit evry software at MTS-620. After TPS reset motor started running better. I saved 4 hour driving to nearest Ducati Service point by ordering VDST from DESMOTIMES. Creating connection can be hard. Everything worked out whitout any extra problem's by following instructions except that wrong temperature reading which is under investigation at Technoresearch. MORE: Ducatidiag - this is link to new site ! and when 38400 speed at screen all ok. Creating connection can be hard. start bike and after some moments data flows to screen. Free licence can be get there too ! It works on 2 and 4 bores engines. first product that could do that,... hmm.,.. is this true ?